Our fifth and final Catching Fire still has just been released from Hunger Games Explorer. 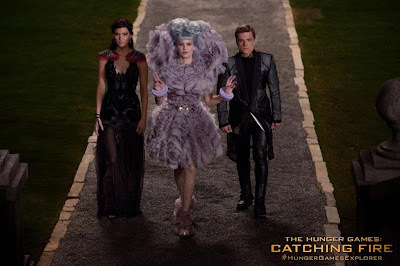 This time it features Katniss, Effie and Peeta! They appear to be arriving at Snow's mansion for the Capitol ball at the end of the victory tour. Here's the quote accompanying the still: "Effie - the only reason they get anywhere on time." Let us know what you think of the still in the comments!